The Embassy of Bangladesh in Seoul celebrated Bangla New Year 1426 in a colourful manner on Sunday at the City Hall, one of the centres of Seoul. The event was attended by over 700 guests, including ambassadors and diplomats of different embassies, Korean nationals, and members of different social organisations of Bangladesh community as well as expatriate Bangladeshis. On this auspicious occasion, the auditorium was decorated with colourful banners, festoons, balloons etc. Booths were also set up with Bangladeshi handicrafts inside the auditorium, said a press release on Monday. Yim Geun-Hyeong, Ambassador for International Relations to Seoul Metropolitan Government, graced the occasion as the guest of honour. The event began with the singing of esho hey Baishakh by the Embassy family. Wishing a happy new year, Ambassador of Bangladesh to the Republic of Korea Abida Islam said the participation of the people in the event irrespective of religion and caste is indicative of secular spirit of Bangladesh. She also pointed out the similarities between the Bengali New Year and Korean New Year Seollal. Greeting happy New Year, Yim Geun-Hyeong highly admired about Bengali culture in his congratulatory remarks. One of the major attractions of the event was Mangal Shobhajatra. Wearing colourful dresses, the people participated in this procession with masks, banners and flags. Dance performances ‘abohoman Bangla’ and ‘jonmechhi ei deshe’, performed by a 10-member dance troupe from Bangladesh Shilpakala Academy, mesmerised the audience. In the three-hour long cultural segment, the Korean artists played harmonica and performed soprano. The expatriate Bangladeshis also performed song, dance and recitation in this segment. The guests were served with traditional panta-ilish and different types of smashed items. 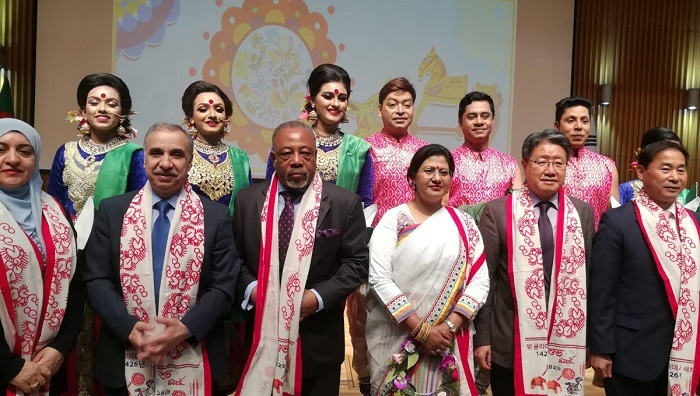 Other Bangladesh missions abroad, including Bangladesh High Commission in New Delhi, Bangladesh Embassy in Athens, Bangladesh Embassy in Paris and Deputy High Commission in Karachi, also celebrated Pahela Baishakh.